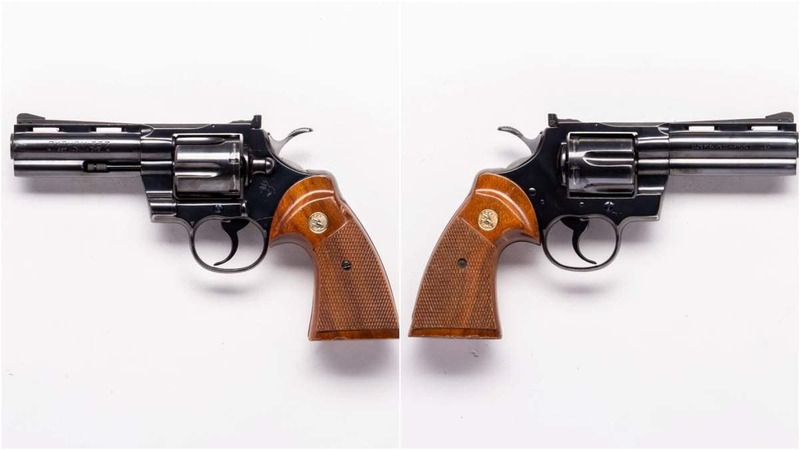 From the wide range of options in the Guns.com Warehouse, we bring you an aristocrat in the world of double-action revolvers, the Colt Python. 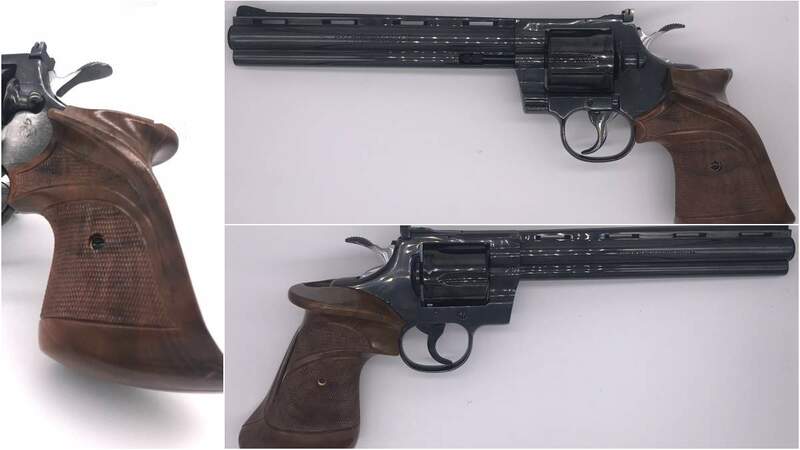 When it hit the market in 1955, the Python was perhaps a high-water mark of sorts when it came to combat wheelguns and to this day was one of the few hand-fitted modern revolvers to be factory produced for the commercial market. Early Colt advertisements characterized the beefy .357 Magnum-caliber six-shooter as, “A finer gun than you actually need,” and its list of standard features set it apart from many of its pencil-barrel contemporaries. Featuring a full underlug with a shrouded ejector rod, ventilated rib barrel, and adjustable sights, Pythons are distinctive and quickly identified at a glance. The first catalog price on the guns was $125 — about three weeks pay at a time when the price of a gallon of gasoline was 23 cents. 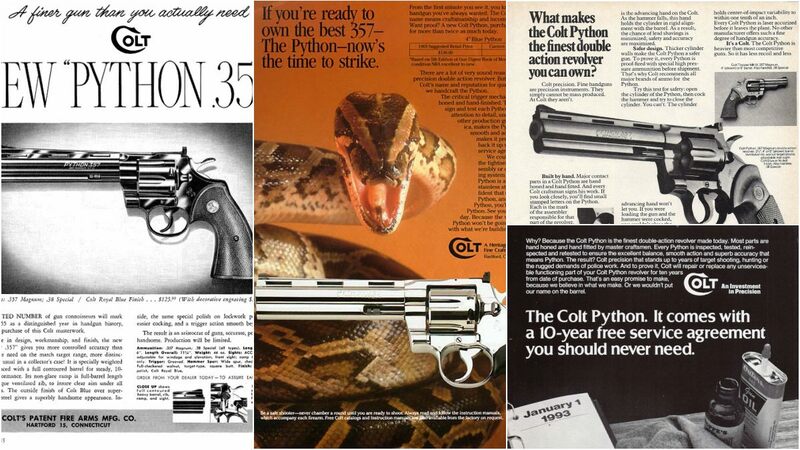 A reoccurring pledge in Colt adverts for the lifespan of the Python was a hand-fitted revolver that they stood behind and would likely endure for generations. 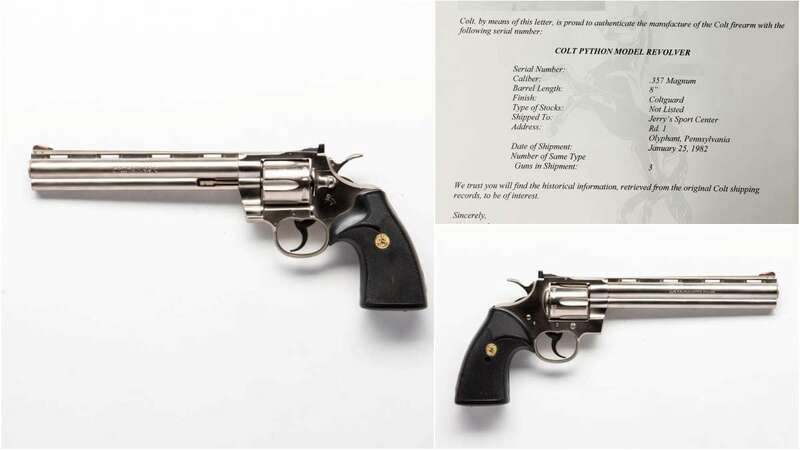 Colt long banked on keeping the gun as a top-tier offering, continuing the hand-honed and hand-fitted production over the years, adding factory laser boresighting to the process in the 1970s, and even going so far as to offer a 10-year “free service agreement,” a rarity in gun making at the time. With a strong lock-up, thick cylinder walls and a heavy frame, the big Python became popular on both the commercial and police market, at one time arming state troopers across several states during the age of basketweave leather and polished brass whistle chains. Over its 50-year run, the Python saw a number of variants with 2.5-, 3-, 4-, 6- and 8-inch barrel lengths, a few caliber experiments, and some specialty guns. 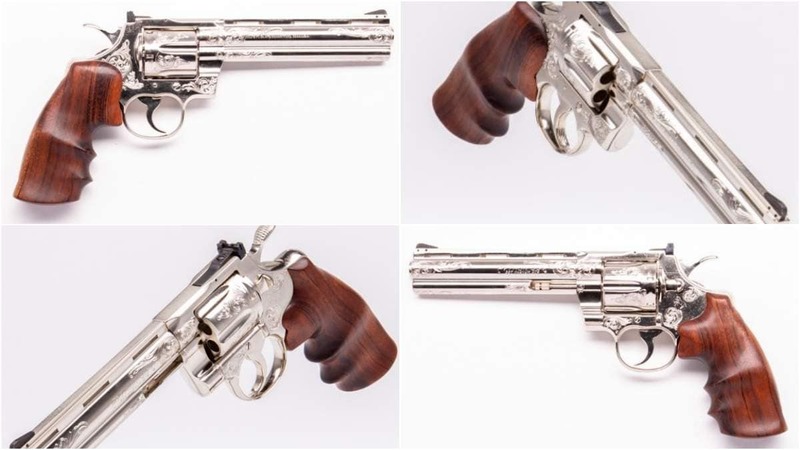 The revolvers were produced in a range of finishes including an electroless nickel– referred to as “ColtGuard” by the company– stainless, polished nickel, Royal ColtGuard, an “Ultimate Bright” stainless, blued, and Colt Royal Blue, among others. 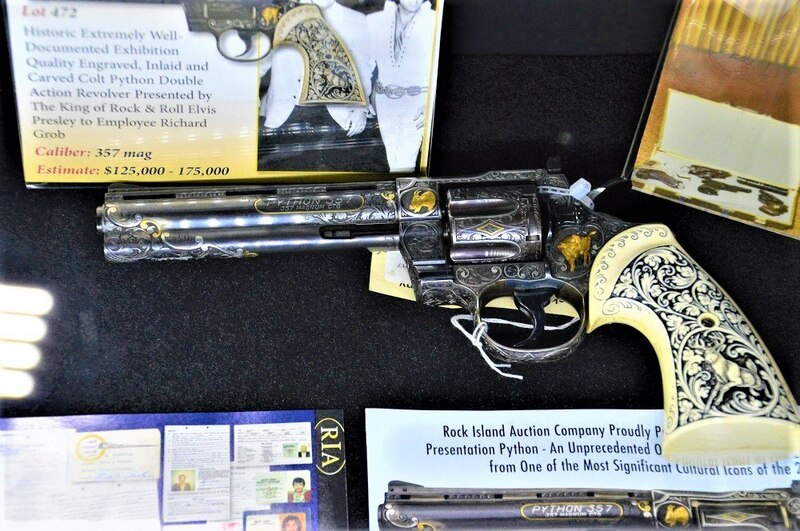 This 1981-vintage 8-inch barreled Python with its beautiful ColtGuard finish, according to Colt’s Archive Department, was shipped to a Pennsylvania sporting goods store with two others in 1982. It’s now in a cold warehouse in Minnesota looking towards a forever home. Over the course of the 20th Century, the Python went on to become as much of an American icon during the Cold War as Detroit muscle cars, Chuck Taylors and Lynyrd Skynyrd. In the hands of everyone from Charles Bronson and Burt Reynolds to Laurence Fishburne and Tom Savini, the gun has appeared hundreds of times on both small and large screens for decades. Even overseas, the original “Professional,” French action hero Jean-Paul Belmondo, carried a 6-inch Royal Blue Python for heavy lifting. Elvis, a pretty big gun guy, gave an extensively customized Python to a friend and member of his “TCB” crew. In 2017, that 6-inch barreled hogleg went for $172,500, a record for the model. 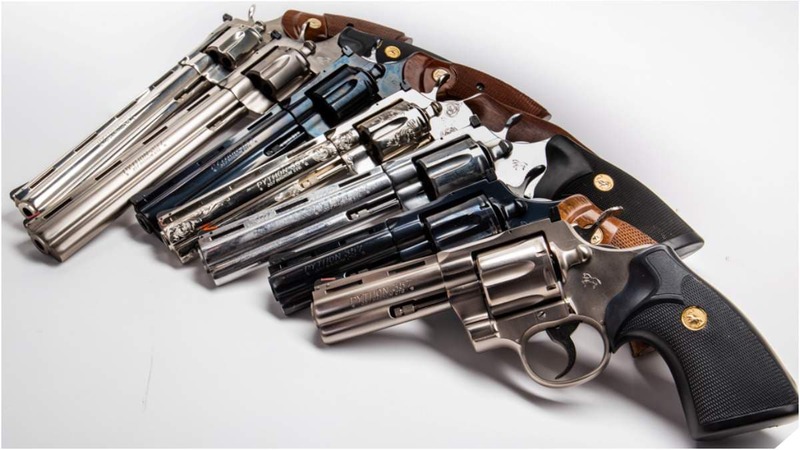 Even today, with the gun long out of production, when the likes of Samuel L. Jackson and Vinnie Jones need to be made even more super-sized, or a fictional Rick Grimes has to confront the zombie apocalypse, their hands are filled with a Colt Python. 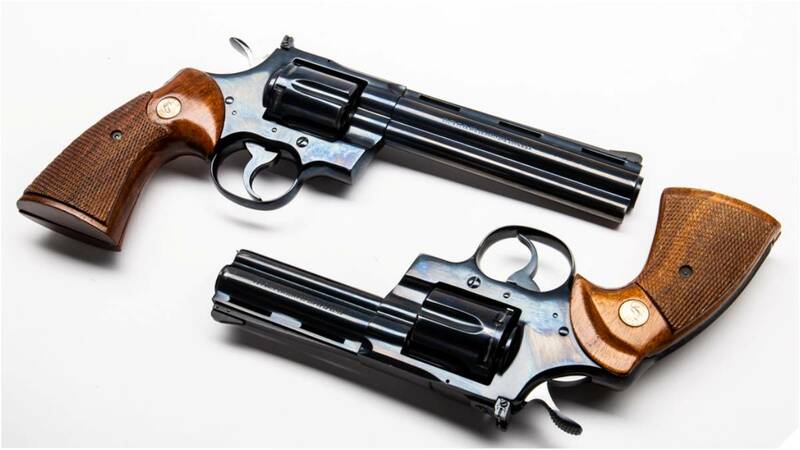 Sadly, Colt began trimming back on making the big I-Frame in 1996, switching from standard production of the classic model to the more limited Ultimate Python and Python Elite models. These late models soldiered on for another decade in declining numbers until the vaunted snake gun fell from the company’s catalog altogether after 2006. 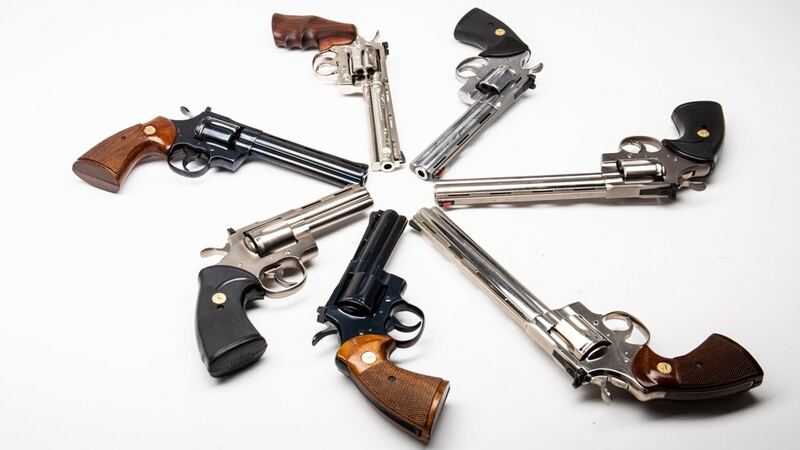 However, although the line has been shut down nearly 15 years, Guns.com still has you covered when it comes to these quintessential revolvers, so be sure to check back from time to time and see what we have on hand. Also, if you have one for sale, we can handle that, too.